STULZ and CoolIT Systems have partnered to deliver innovative cooling solutions to the data centre industry. Direct Chip Liquid Cooling Solutions allow customers to capture dense heat loads at the source (inside the servers) and efficiently move it to the outside atmosphere. In a typical data centre application, standard row mounted air conditioners provide 100% rack cooling efficiently and reliably. STULZ row cooling is ideal for low to medium density loads. In hybrid configurations of typical air cooled servers and liquid cooled servers, the heat load requiring removal by room air conditioning is reduced significantly. 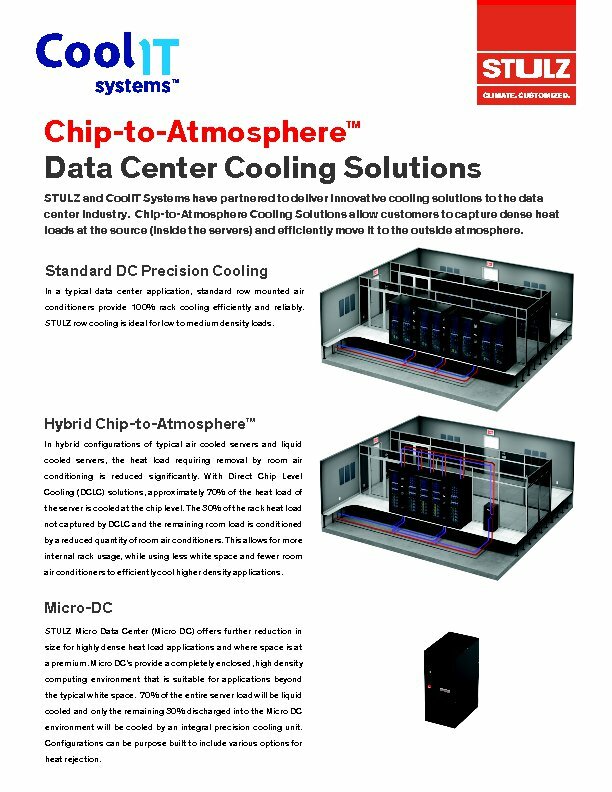 With Direct Chip Level Cooling (DCLC) solutions, approximately 70% of the heat load of the server is cooled at the chip level. The 30% of the rack heat load not captured by DCLC and the remaining room load is conditioned by a reduced quantity of room air conditioners. This allows for more internal rack usage, while using less white space and fewer room air conditioners to efficiently cool higher density applications.